The Carefree fiesta Roll Out Awning has long been a favourite amongst RVers, not only in the USA but here in Australia as well. It is a simple to use, manual, spring loaded roll out awning featuring vinyl Weathergaurd of superior construction, which protects the fabric from the sun, scrapes and exposure when the awning is rolled up. The 8’ – 14’ awnings project up to 7’3” (2.21mt), while the awnings from 15’ – 21’ project up to 7’9” (2.36mt). These work together to ensure the Fiesta does not come undone during travel. They eliminate the need for you to stretch and fumble for the roller lock. Built onto the hardware and self storing. They help to keep your awning taught and provides extra protection from the elements (not available on arms supplied to suit poptops). Solid and rugged. 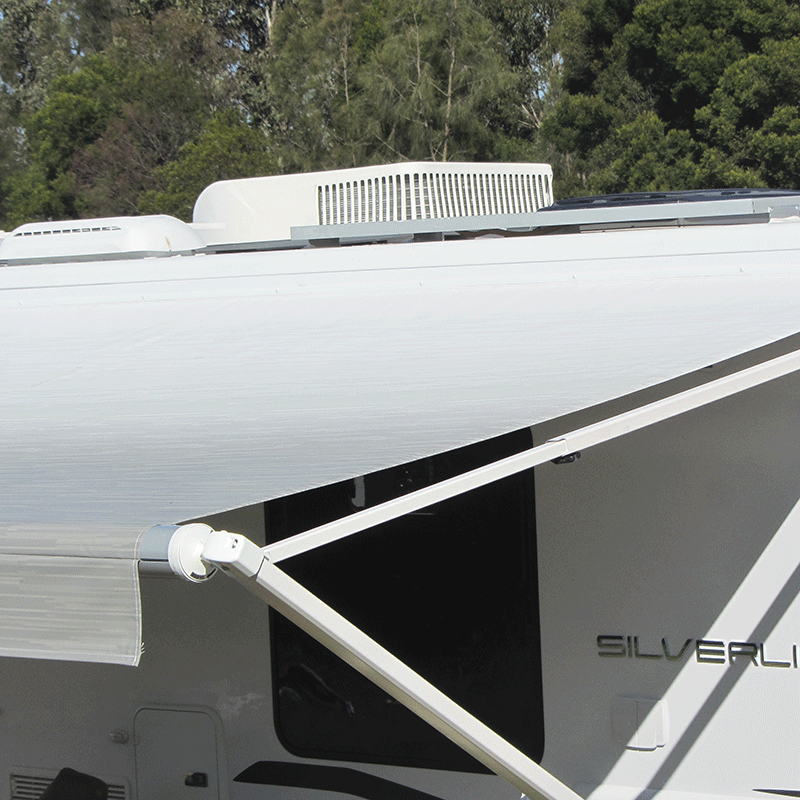 The awning hardware and castings are white to suit the trim of any RV. Located on the inside of the hardware channels, the single track slider stops the rafter binding during setup and storage. The result is a smooth gliding motion as soon as you slide the rafter up the hardware arm.